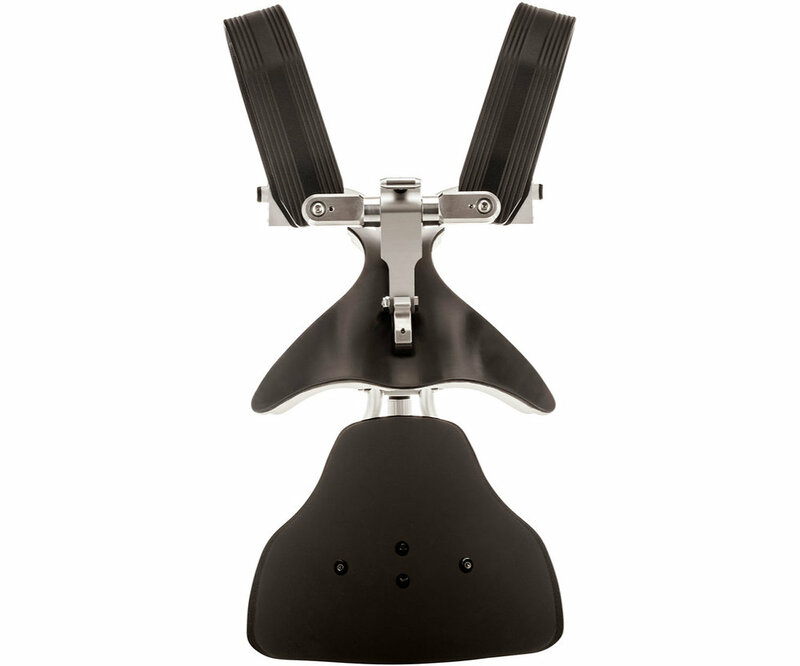 The only marching carrier developed to support correct posture and playing position. Now available for even the smallest of players. All of the features and benefits of the ABS Auto Release Posto series carriers, and with overall 25% smaller shoulders and tubular body, the ABS Petite carrier was designed for for heights 5’2” and under. Advancing both Posto Series and Contour Hinge technology, the new Articulating Back Support Auto Release, like its ABS predecessor, enhances all the wellness benefits along with redistributing unwanted weight off of players ’ shoulders, resulting in unprecedented comfort and freedom while promoting healthy posture. It is so advanced there are multiple patents recognizing its innovation and technology. There is nothing else like it. The Articulating Back Support features a compound, contoured back plate spreading the load over a greater area, and promoting the natural curvature of the player's back. In addition, the ABS back plate incorporates a specifically designed shape eliminating all contact with player’s shoulder blades (scapulae static or dynamic rotation) and performing movements. The new Auto-Release feature is designed to reposition automatically as the carrier is lifted off and on, resulting in easier mount and dismount without loosening any of the ABS sizing or contour fit adjustments. One important key to superior comfort is better fit, and better fit depends on adjustability. Proven Contour Hinge technology allows these carriers to become one with the player while ergonomically contouring the player’s torso for both genders. This body profiling fit reduces unwanted torque, yet remains secure and durable enough to be used through the daily rigors of marching field drills. ABS petite carriers feature overall 25% smaller shoulders and tubular body than the standard size ABS carriers. The polycarbonate abdomen has also been inverted, allowing for a further compact, custom fit for younger players or smaller frames. Padded, powder coated magnesium shoulder supports are 38% lighter than their aluminum counterparts, providing ultra lightweight, long-lasting support and comfort. 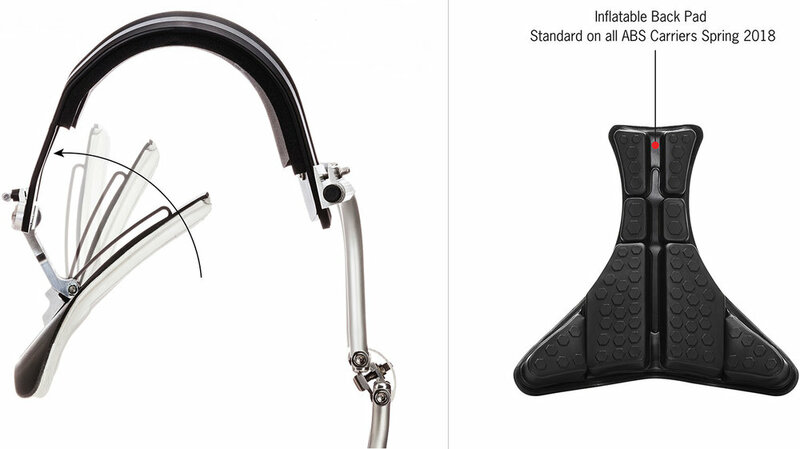 Patented Contour Hinge technology incorporates two specifically designed pivot points that independently adjust, profiling both the upper and lower body of the player, supporting a 1:1 real time extension of the performer's elaborate maneuvers that are essential to contemporary band performances. Transfers all the torque load only to the tubes, away from the abdomen plate, improving rigidity and stability to the instrument-creating a more reliable playing position environment. By incorporating the Posto bridge technology with Contour Hinge and ABS, this carrier becomes one with the player and remains secure and durable enough to be used through the daily rigors of contemporary marching movement. Complementing any size bass drum, the invertible bass drum post will conform to any radius, while the support pad adjusts independently, allowing for fine-tuning and positioning during play.